The organisers of the Transatlantic Race 2011 (TR 2011), the Royal Yacht Squadron, New York Yacht Club, Royal Ocean Racing Club and Storm Trysail Club, have extended the deadline to enter the Race to 31 March. With the transatlantic fleet now up to over 30 entries and many new enquiries following the success of the RORC Caribbean 600 - part of the companion Atlantic Ocean Racing Series - the organisers encourage those interested in entering the Transatlantic Race as soon as possible to secure a spot since the Notice of Race notes a maximum of 50 yachts for the race. The TR 2011 will cover 2,975 miles from Newport, R.I., to the Lizard, England. The focus of pre-race activities will be the New York Yacht Club’s Harbour Court clubhouse in Newport, R.I. There will be three staggered starts from 26 June to 3 July. The awards ceremony on 9 August and other post-race activities will be held at the Castle, the home of the Royal Yacht Squadron in Cowes, England. The fleet will include IRC Racing, IRC Racer/Cruiser, Classic and Open divisions with a minimum length overall of 40ft and no maximum. Competition is building within several segments of the diverse fleet, notably the 100ft and up range which includes Sojana, Rambler 100, ICAP Leopard and Maltese Falcon. Tight racing is also expected in other classes and divisions, such as yachts in the under 50ft range in IRC Racing and IRC Racer/Cruiser including the Class 40s - Concise 2, Dragon and Kamoa'e, the Rogers 46s Shakti and Varuna, as well as British Soldier ASA, Jacqueline IV, Sasha, Dawn Star and Carina. The Transatlantic Race 2011 is the centerpiece of the Atlantic Ocean Racing Series and is organised in concert with the following clubs: Royal Malta Yacht Club, Annapolis Yacht Club, Ida Lewis Yacht Club, Montego Bay Yacht Club, Naval Academy Sailing Squadron, Jamaica Yachting Association, Antigua Yacht Club and Real Club Nautico de Sanxenxo. Two races in the AORS have been completed: the Pineapple Cup - Montego Bay Race and the RORC Caribbean 600. The Pineapple Cup, from Ft Lauderdale, Fla. to Montego Bay, Jamaica, a distance of 811 miles, was won by Genuine Risk, the 97ft canting keel super maxi skippered by Sweden's Hugo Stenbeck. 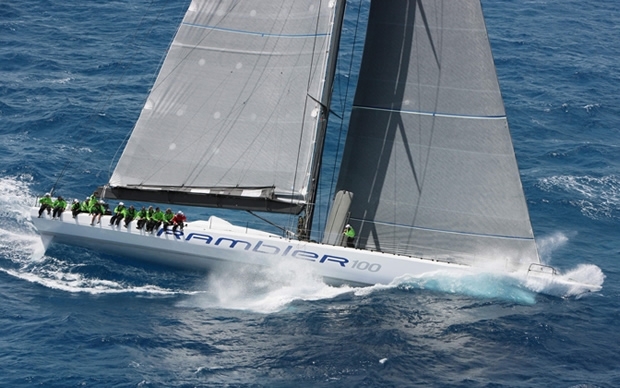 In the RORC Caribbean 600, George David’s Rambler 100 took line and overall IRC honors and set a new monohull course record of one day, 16 hours, 20 minutes and 2 seconds. In addition to the Transatlantic Race 2011, upcoming races in the AORS are the Annapolis to Newport Race (June 3); Rolex Fastnet Race (August 14); Biscay Race (September 11-12) and Rolex Middle Sea Race (October 22).